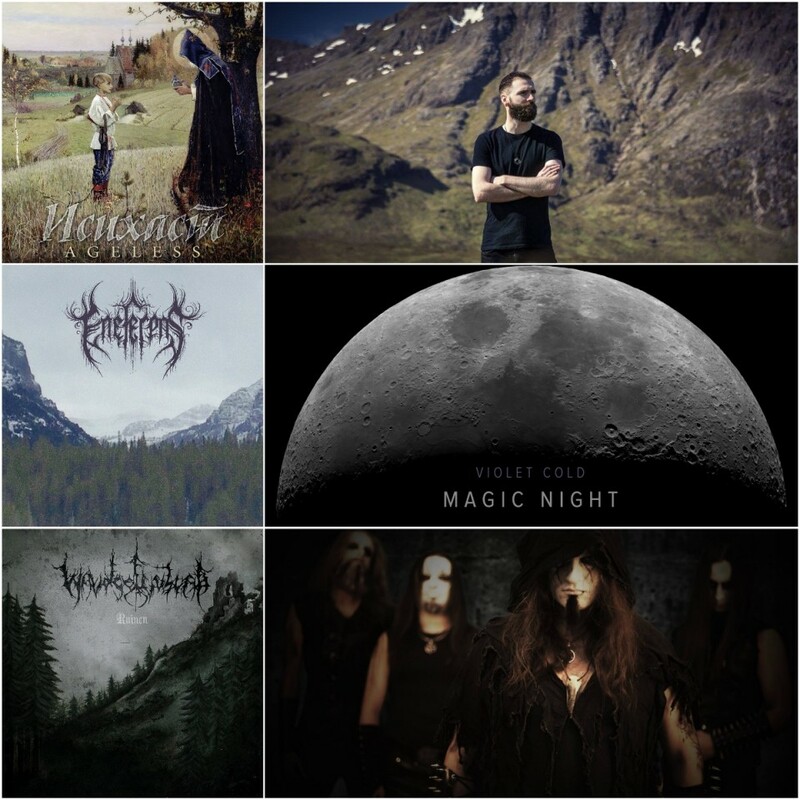 Our new selection of interesting releases by Waldgeflüster (Germany), Violet Cold (Azerbaijan), Saor (Scotland), Eneferens (USA), the album by orthodox black metal band Hesychast (USA) and the cover of Queen’s song by symphonic black metallers Elderblood (Ukraine). The debut album "Ageless" from Hesychast is a bright and, most importantly, quality example of the so-called unblack metal — a genre in which instead of the traditional for black metal invocations like "O Father! O Satan! O Sun! ", you can hear such appeals as "Consider and answer me, oh Lord my God". To create the right atmosphere, the band also uses inserts from the Russian movie "Ostrov" and the choir of "church", which, apparently, was just recorded at the studio and later refined by effects. For those who are into the religious theme, we can also recommend the debut album "Litourgiya" by the Polish black metal band Batushka and the latest EP "Popestar" by the Swedish occult rockers Ghost. This atmospheric pagan/post-black metal release stands out by its German-language lyrics and using of unconventional for black metal instruments, such as the mandolin, violin, and Finnish drum which was recorded by well-known in the metal community Austin Lunn — founder and the only member of the American project Panopticon, who earlier this year has released a joint split with Waldgeflüster. From all "Ruinen" tracklist, it’s worth to highlight the composition "Ruinenfelder", which starts as an acoustic song with clean vocals, and after the second minute continuously immersed in a heavy post-black metal sound, while retaining the melodics defined by its opening chords. Violet Cold — "Magic Night"
Violet Cold is a project by the self-taught musician from Azerbaijan, Emin Guliyev. Violet Cold can boast not only a large number of releases (Guliyev regularly presents new singles, LPs, and EPs) but also an enviable support of music lovers, who actively buy each musician's album and even track on Bandcamp. The project’s new LP "Magic Night" is an instrumental shoegaze/post-black metal, full of keyboard parts, and different space sound effects. This atmospheric release, which came out in January 2016, was highly estimated by various critics and ordinary listeners. The only thing you can complain about the album is the sound of drums which feels dead. Saor is a one-man band, formed by the Scottish musician Andy Marshall. This November, Saor has released its third album "Guardians", which keeps the style, set with two previous works. The new LP is an atmospheric black metal with a noticeable Scottish flavor, achieved through the using of such folk instruments as a fiddle, Irish frame drum bodhrán, and, of course, bagpipes. Eneferens — "In The Hours Beneath"
"In The Hours Beneath" is a new work of Jori Apedaile’s one-man band Eneferens, which has also released another one atmospheric full-length album "The Inward Cold" this year. "In The Hours Beneath" begins as a typical post-metal album with clean vocals, which then gradually begins to whip up the overall ambiance with the following passing into doom and black metal. With good reason, this release has become one of the outgoing year’s favorites among the fans of atmospheric heavy metal music. "Innuendo" is a cover of one of the most famous Queen’s song made by the Kharkiv-based symphonic black metallers Elderblood. According to the band’s leader, the musicians originally planned to record a song with extreme black metal vocals, but "it was spoiled the song". In the end, Elderblood invited a session musician, a young singer George (ex-On Level, N0-M0N0) to do clean vocal parts. Often, covers just become a blind imitation of the original song, and in this regard, "Innuendo" by Elderblood and George stands out on their background due to bringing into the song even more epic sound.